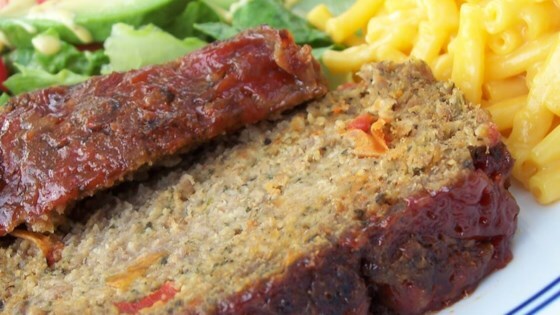 "This soft-textured meatloaf is speckled with vegetables. My kids and I love the flavor of this dish. There's always enough for sandwiches the next day and crumbled into spaghetti sauce the day after that." Set the ground turkey and ground pork out at room temperature to warm slightly. Heat the oil in a skillet over medium heat; cook the carrot, bell pepper, onion, garlic, and spinach in the heated oil until soft; set aside to cool. Mix together the turkey, pork, bread crumbs, wheat germ, eggs, 2 tablespoons ketchup, salt, and pepper in a large bowl. Add the vegetable mixture and continue to mix until evenly combined; shape into a loaf; lay on the prepared baking sheet. Whisk together the honey and 1 tablespoon ketchup in a small bowl; spread over the meatloaf. Bake in the preheated oven until no longer pink in the center, 60 to 70 minutes; remove to a serving platter and allow to rest 5 minutes before slicing. Great meatloaf! I used all turkey and also used zucchini instead of spinach. It was so moist, I will use this recipe again for sure!